This number does not include Donbas militants. 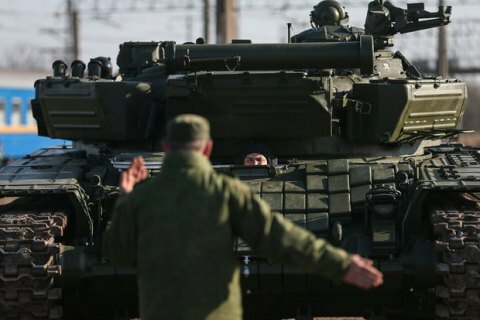 The Russian Federation has amassed around 53,000 servicemen at the Ukrainian border by late December 2018, the communications and press department of the Ukrainian Defence Ministry has told Ukrinform. "The Russian Federation continues to strengthen its military groups near the state border of Ukraine. In particular, 28 battalion tactical groups have been deployed at the Ukrainian border and in the temporarily occupied area of the Autonomous Republic of Crimea by the end of December 2018. The total number of the mentioned troops (not including those deployed in the temporarily occupied territory of Donetsk and Luhansk regions) is around 53,000 servicemen," the ministry said. President Petro Poroshenko has recently said that Russia boosted its military group along the Ukrainian border in the autumn.